Solutions, examples, videos, worksheets, and activities to help Algebra II students learn about arithmetic sequences. The following figure gives the formula to find the nth term of an arithmetic sequence. Scroll down the page for more examples and solutions. A list of numbers that follows a rule is called a sequence. Sequences whose rule is the addition of a constant are called arithmetic sequences, similar to geometric sequences that follow a rule of multiplication. Homework problems on arithmetic sequences often ask us to find the nth term of a sequence using a formula. Arithmetic sequences are important to understanding arithmetic series. How to find the general term of an arithmetic sequence? Determine the nth term of an arithmetic sequence. Determine the common difference of an arithmetic sequence. Determine the formula for an arithmetic sequence. An arithmetic sequence is a sequence that has the pattern of adding a constant to determine consecutive terms. We say arithmetic sequences have a common difference. 1. A sequence is a function. What is the domain and range of the following sequence? 2. Given the formula for the arithmetic sequence, determine the first 3 terms and then the 8th term. Also state the common difference. 3. Given the arithmetic sequence, determine the formula and the 12th term. What an arithmetic sequence is with a few examples. 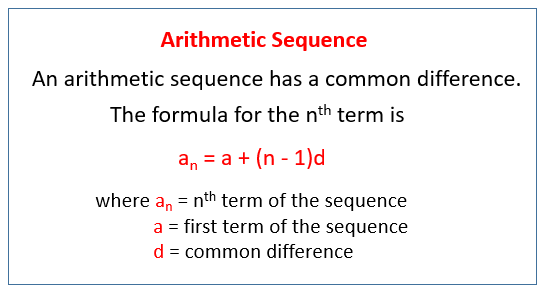 An arithmetic sequence is a sequence where succeeding terms in the sequence differ by a constant amount. Determine which of the following sequences are arithmetic. If they are arithmetic, give the value of 'd'. An arithmetic sequence may be thought of as a linear function whose domain is the set of natural numbers. The y-intercept is not the first term of the sequence. 1. Find a formula for the nth term of the arithmetic sequence whose common difference is 3 and whose first term is 2. 2. The fourth term of an arithmetic sequence is 20, and the 13th term is 65. Write the first 6 terms of the sequence. 3. Find the 9th term of the arithmetic sequence that begins with 2 and 9. 4. Find the sum of the first 9 natural numbers. Find the common difference and the term named in the problem in the following arithmetic sequence.